Lewis Hamilton will start the British Grand Prix from pole position after edging out title rival and Mercedes team-mate Nico Rosberg in front of his home fans. 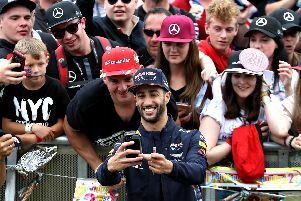 The 30-year-old posted a time of one minute 32.248 seconds to beat Rosberg to top spot by just 0.113sec to the delight of the 110,000 crowd at Silverstone. Felipe Massa (Williams) will start third on the grid. McLaren’s season, which has long since spiralled into disarray, failed to show any signs of improvement on Saturday. Fernando Alonso and Jenson Button were knocked out in the opening phase of qualifying and will start only 17th and 18th. Hamilton appeared to be on the backfoot overnight after seeing Rosberg top the timesheets in both sessions on Friday. But the world champion, who has now started from pole in eight of the nine grands prix this season, dominated final practice on Saturday morning before seeing off Rosberg’s challenge. Hamilton did the damage on his first flying lap in Q3 to claim the 46th pole of his grand prix career, which now puts him ahead of Sebastian Vettel in the pantheon of all-time qualifying greats. Only Michael Schumacher and Ayrton Senna have more poles than the British driver. Felipe Massa, who finished third last time out in Austria, leads an all-Williams second row with Valtteri Bottas starting fourth. Kimi Raikkonen, whose future at Ferrari hangs in the balance, turned in one of his better qualifying displays of the season to edge out Vettel. The Ferrari pair will start fifth and sixth. For Hamilton, it is the third time he has secured pole at his home race, but on the two previous occasions - in 2007 and 2013 - he has failed to win. He and the 140,000 crowd expected here on Sunday will hope that statistic changes. “It is special to get pole on your home turf, the fans really do motivate me,” Hamilton said. McLaren headed into their home race already in the midst of the worst season in their coveted history, and this latest result is unlikely to do anything to lighten the mood at Woking. The British team have just four points to their name in 2015 after Button finished eighth at the Monaco Grand Prix. But the chances of adding to their tally on Sunday appear extremely bleak given their woeful display in qualifying. Alonso had already predicted that McLaren would fail to make it out of Q1, and the double world champion’s worst fears were realised on Saturday. McLaren, who have won a combined 20 drivers’ and constructors’ titles, will occupy the penultimate row of the grid with only the Manor drivers - Briton’s Will Stevens two seconds faster than team-mate Roberto Merhi - behind them. And Alonso predicted that their dour campaign will not get any better in the ensuing races. “Belgium will be worse, Monza worse, it sounds strange but this is the best qualifying of the season for us,” Alonso told the BBC. Max Verstappen, the 17-year-old Toro Rosso rookie, had fared well in practice but he was left frustrated after qualifying only 13th. The Dutchman described his car as “so bad compared to practice”. His team-mate Carlos Sainz will start five places ahead of him in eighth.